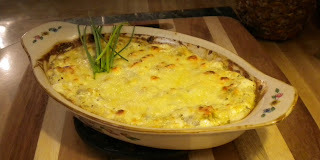 Zo's Artichoke Dip disappears fast no matter where we take it! As a matter of fact we enjoyed it so much after she came up with it that we had it 5-6 nights in a row as a snack! I think the roasted Chiles are what make it so amazing! So do not skimp out on those! Enjoy! Place baking safe dish on the middle oven rack and back for 20-25 minutes or until hot and bubbly. Serve while still warm with crackers or tortilla chips. Enjoy!